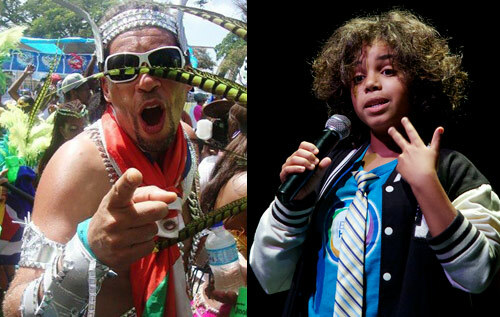 Chewstick co-founder Najib Chentouf will take to the stage with his 11-year-old son Yassine this Saturday night at the Chewstick Lounge for an evening of music, comedy, poetry and stories. Many may be familiar with some of Najib’s monologues from his Fresh TV show Tan Zaoui Takes back in 2003/04 while Yassine has been a regular on the stage, including the Chewstick anniversary concerts, performing entertaining little skits. Najib said: “Like father like son? Something like that — it’s definitely going to be a family affair. “This is our first Griot session. My son will be opening the show — he is 11 going on 33. He has got a mix of poems and stories and maybe a little bit of comedy. “Some people may know or recall Tan Zaoui Takes on Fresh TV —I wrote a lot of monologues much like you would see on late night television — your Jay Leno and Bill Maher so I will be dusting off a few of those. Music-wise there will be a mix of old school, soca, calypso and some hip-hop. DIA will be jamming along and there will be various other surprise guests. Najib promises to perform a song he co-wrote with Chewstick co-founder Gavin Smith called The Potato Song. Following the show there will be an after party featuring DJs Tan (Najib), and BlAzian Kidd (Grace Edwards). Najib added: “It’s really nice to feature Gracie because I helped her learn how to DJ. She has come on leaps and bounds so I am really proud to have her play the after party.” Showtime 8pm start $20.